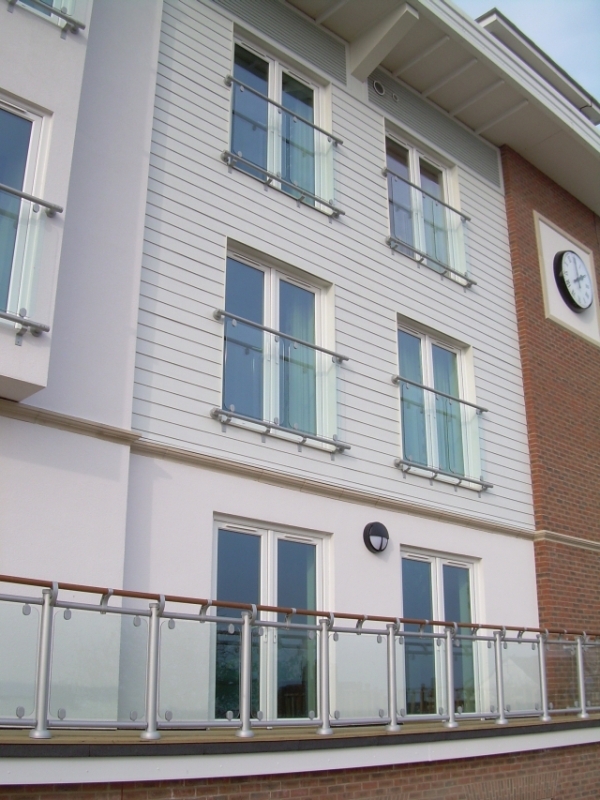 Balustrade system for commercial decks and balconies, including those subject to overcrowding. Combines aluminium newel posts and rails with zinc alloy brackets, hardwood handrail and glass infill panels. Newel posts suitable for resin anchor fixing to concrete, or bolting to wood or steel structure. Suitable for applications allowing free location of newel posts. Withstands loadings of up to 1.5 kN/m (to BS 6399) when installed to manufacturer instructions. Posts and rails: Aluminium 6060 T6. Brackets: Zinc alloy Zamac 3 (to BS 5338) powder coated FHN8328 silver (to BS 3900). Glass panels: 8 mm-thick clear toughened glass (to BS EN 12150-2). LD585 - 45 x 2400 mm (diameter x l). LD575 – 80 x 1000 mm (diameter x l). LD578 – 46 x 900 mm (diameter x l). LD576 – rail to rail bracket for handrail and LD577 – newel to rail bracket for handrail. 1004 mm, top and bottom rails can be cut on site. Minimum varies with size of glass panel. Large glass panel, 800 x 750 x 8 mm, with four fixing brackets. Small glass panel, 350 x 750 x 8 mm, with four fixing brackets. Two fixing brackets for handrail to wall at end of run. Two end caps for handrail.